MacBook Pro Penryn Update Imminent? To Deploy MacBooks in Schools or Not? Is MacBook Air Good Enough To Be Your Only Computer? "Only Apple knows exactly how many MacBook Airs it expected to sell, and thus, only Apple knows whether current figures are disappointing. Still, new findings suggest that people are doing more looking than buying, and that by year's end, transactions involving the Air will account for only 16 percent of Mac sales. "So place your bets, people - will Apple and its investors find this acceptable? The 16 percent stat comes from Piper Jaffray's Gene Munster, so although he talked to just 20 resellers, it'll be somewhat hard to refute. Also, Munster added that about 60 percent of those resellers are seeing less initial demand for the Air than they did for the 13-inch MacBooks two years ago." Primate Labs Blog has posted a fascinating list of Mac performance benchmarks spanning back from the latest quad-core Mac Pros to 400 MHz PowerBook G4s. Results were collected from the Geekbench Result Browser for Macs with standard processors (i.e., no processor upgrades, overclocked processors, or Hackintoshes) with at least 512 MB of RAM running Leopard. Keep in mind that Geekbench 2 only measures processor and memory performance which is why, for example, MacBook and MacBook Pro scores are so similar, despite both having radically different graphics adapters. "Is your laptop sluggish when opening folders with lots of documents inside? Do video clips stutter when you play them? Are you constantly looking for items you can delete or burn to DVD because you're always running out of space? Then it sounds like you need a new laptop hard drive! "The Hitachi Travelstar 7K200 (approximately US$210) is a 200-GB, 7200-rpm spindle drive with a 16-MB buffer running on the Serial ATA platform. Originally sold at the Enterprise level to go in large server banks, this 2.5-inch drive has developed a strong following among mobile content creators (video editors, animators, DVD authors, etc.) who demand the best performance possible in the smallest size that fits their laptops." "Like the SuperDrive, MacBook Air's USB-Ethernet adapter was announced as being compatible only with this machine. Simply, if it is connected to another Mac, it will be seen, but not work. "Christophe, however, has found a way to make it work in an optimal way on any machine that runs OS X 10.5.2...."
"Although they often haven't been highly-publicized issues, MacBooks and MacBook Pros have been plagued with a number of keyboard bugs for some time now. In December, Apple issued a software update to deal with frozen keyboard problems, but some users reported that the update hadn't squashed the bugs they were experiencing. Luckily, Apple is taking another crack at keyboard issues, and has released Keyboard Firmware Upgrade 1.0 for MacBooks and MacBook Pros." "In reading the Apple teas [sic] leaves it appears that a MacBook Pro update is imminent. A source tells me that it's within-the-next-30-days imminent. "Intel chief executive Paul Otellini says that 45nm Penryn is up to a 20 percent performance increase over 65nm chips, more energy efficient, and uses halogen-free packaging which is better for the environment...."
Link: MacBook Pro Penryn Update Imminent? "Most of you know that I just got a new MacBook and really love it. On a personal level, it's darned close to perfect for what I do. Writing; systems administration; creating movies, presentations, and websites; and otherwise getting my jobs done come very naturally (and come in a lightweight package that easily slips into my messenger bag). Everything really does just work. The ads, to this point, seem quite accurate. "However, what works really well for me may not make sense for a large-scale deployment in a public school...."
"Does the Mac add enough value in OS X and it's bundled applications to justify its cost (I know comparably-configured Windows machines don't have much a price differential - I'm talking about low-powered cheap machines for my low-powered users)?" "At the start of the year, the T3 gossip machine leapt into pre-Macworld overdrive, forecasting a 12.1-inch lappy or iTablet. What we actually got was the world's slimmest notebook. Not too far off, then...."
"Considering this notebook measures just 40mm at its thinnest point and weighs under 1.5kg, it's a miracle this thing actually made it off the design table. "But Apple has left a few blueprints behind, for the Air lacks FireWire, Ethernet, an optical drive and no more USB ports. A USB to Ethernet adapter costs an extra £19 and the deficiency of FireWire will madden those with compatible digital camcorders or peripherals . . . the Air is strictly for high-flyers. It's a show-off's dream and the shape of things to come in the lap-sector but don't expect it to replace your family 'pooter." "It started so badly. My first few hours with the MacBook Air were full of frustration as I struggled - and failed - to import data and settings from my old computer. To make this ultra-slim laptop fit into its aluminium casing Apple has had to chuck a lot overboard - including a FireWire port - so that means you are completely dependent on wireless technology to import your data or install new software. And for me - and plenty of others as far as I can see from online discussions - Apple's new migration assistant did not work. "But from then on life with the Air just got better and better. I took the laptop with me to Barcelona and used it as my prime tool for all my reporting from Mobile World Congress. Its sheer portability was a joy - when you're racing around a crowded congress site, a 1.4 kg load feels an awful lot better on your back than the 2.4 kg machine I normally carry." "Now that I've had one for a week or so, I can tell you that while the MacBook Air may not be for everyone, it is very much for me." "A week into the MB Air and I can honestly say that I have almost no pain or fatigue in my wrists when I use the machine standalone...."
"Being less of a web-app zealot as others, I am still on the fence on this one, and even after using the MacBook Air for close to two weeks, I still can't make up my mind - whether to keep using it as my only machine or pair it with the MacBook...."
Link: Is MacBook Air Good Enough To Be Your Only Computer? "A big concern for anyone using a notebook computer for any length of time is the heat it generates. It actually came to a head a few years ago when the lawyers at most notebook computer manufacturers replaced the term 'laptop' with 'notebook' for fear of litigation. "To measure the heat generated by the MacBook Air I created 12 temperature zones on the bottom plate. I flipped over the MBA and mapped locations in three rows and four columns. Zones 1 to 4 are across the top from left to right. Zones 5 to 8 are in the middle row and 9 to 12 are the bottom row. "I measured the temperatures (in degree Fahrenheit) on the bottom of an MBA (1.6 GHz HDD) and MBP (2.4 GHz Santa Rosa) after approximately three and five hours of use using a Mastercool 52224 infrared thermometer. Both machines were attached to AC power and sitting on a cloth upholstered automan [sic] ...."
The update package will install an updater application into the Applications/Utilities folder and will launch it automatically. Please follow the instructions in the updater application to complete the update process. "I use, on a daily basis, three different Linux distributions: MEPIS 6.5 and 7, OpenSUSE 10.3, and SLED 10 SP1. So, when I saw that Frank Ohlhorst, my colleague over at The Channel Insider, had gotten his hands on a ThinkPad T61 with SUSE Linux Enterprise Desktop 10 Service Pack 1, I was interested in what he would find. "I was also interested in how he got a review model to play with and I didn't, but that's mere envy." "Amid troubling signs of order reductions and weakness in consumer spending, iSuppli Corp. is cutting its outlook for global NAND flash revenue growth in 2008 to the single digit percentage range, down from our previous outlook of a 27 percent rise. Global NAND flash revenue is set to rise marginally in 2008, up from $13.9 billion in 2007. NAND flash is used heavily in consumer-electronics applications - including flash storage cards, MP3 players and USB flash drives - that are driven by retail sales to consumers. With consumer confidence taking a dive due to the US subprime mortgage crisis, the NAND market outlook has diminished considerably in 2008." "Intel is planning to rename its brand name for the upcoming notebook Montevina platform to Centrino 2 in order to clear up confusion for consumers, according to sources at notebook makers. "Intel will then launch seven 45nm SFF (small form factor) notebook CPUs, similar to those used in Apple's MacBook Air and soon other ultra-portable notebooks, in the third quarter of this year...."
"Hopefully, it'll also mean an end to the use of Intel Centrino codenames - 'Carmel', 'Sonoma', 'Napa' and 'Santa Rosa' - as differentiators, an unofficial naming scheme even more confusing for consumers." The NiteCruzer 1510 laptop case introduces the latest addition to a comprehensive line of carryon luggage by Pelican Cases. Business nomads with an eye for trailblazing amenities are chucking dual shoulder bags in favor of the new suave and sleek NiteCruzer - the toughest airline-legal carryon baggage available today. This innovative spin on air travel marks the end of those days when technology and personal belongings required separate but equal spaces. 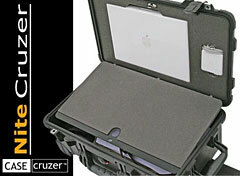 The mobile NiteCruzer 1510 is yet another progressive CaseCruzer design. This cutting edge laptop case with its spacious interior gives globetrotters ample storage for personal belongings. Yet it also pampers laptops with a protective lid compartment that is ideal for the Apple MacBook Pro 13.3-, 15-inch or the new MacBook Air. Arrivals and departures are always smooth with NiteCruzer's deluxe 17-inch retractable extension handle, which allows world-class voyagers to roll in and out of any hemisphere with ease. And since the new NiteCruzer1510 is equipped with side and front handles, assistance won't be necessary when hoisting it into an overhead bin. Fortune-hunters who travel with laptop cases - and who doesn't? - can easily survive the onslaught of tiresome travel conditions because NiteCruzer is a veritable fortress on wheels. The metal reinforced padlock protectors add strength and extra security against cutting, theft and air turbulence. And if travel plans demand that you tolerate stormy weather or seasonal downpours, the waterproof NiteCruzer by Pelican Cases with buoyancy up to 64.2 lbs is capable of rising to nearly any occasion. Road warriors Bruce Johnson and Christine Toy Johnson of ReImagined World Entertainment have spent a lot of time on aircraft this past year. "The laptop is always critical, especially now. When we're on the road, we have to take two. One for writing, and one for design and editing needs," said Bruce Johnson. "I'll often have two different carryons. But I tend to try to find an all-in-one bag that will carry both my laptop and other things." The Johnsons have encountered the full menu of travel headaches. But the most feared is when they fly into a major airport and transfer to a "puddle-jumper" aircraft to travel to remote locations. Often no bags may be carried onto these small planes. "They take your bag. And you just pray at that point," Johnson said. No prayers needed when rolling with NiteCruzer laptop cases. Although the peerless carrying NiteCruzer by Pelican Cases weighs only 15 lbs when empty, it comes with standard features, such as water and dustproof neoprene O-ring seal, automatic purge valve with Gore-Tex® membrane, and easy to open double-throw latches. And, as always, all Pelican Cases come with a lifetime guarantee. 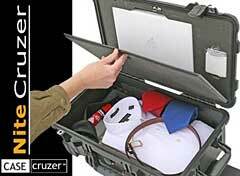 However, the NiteCruzer 1510 is designed to provide moderate protection as a carryon. It is not intended to be used as a shipping container or check-in luggage. CaseCruzer has developed other products for heavy duty protection. Nevertheless, when making cross-country or transcontinental trips and going the extra mile to achieve your business dreams, everyone deserves to upgrade to a dependable overnight travel laptop case so that they can finally experience peace - on Earth and in the air. Think the new NiteCruzer is special? That's right. But when you hear the name CaseCruzer, think Pelican Plus. Pelican Cases can also be reached by calling 800-440-9925 in the US or 909-613-1547 internationally; faxing 909-613-1979; or writing to CaseCruzer at 4665 State Street, Montclair, CA 91763. PR: KeyRemap4MacBook is a keyboard remapper for Mac OS X. Not to mention the change of simple key remap, it has the special remapping like Emacs-mode, SandS-mode (Space and Shift). Very small & concise source code written with C++. Use it as codebase of your original keyremapper. Correct the key repeat behavior. Fixed a minor PreferencePane bug.